While growing up I would always look forward to Diwali because I would get new clothes and Appa would get “sweet boxes” from his colleagues at work. Till I reached college and started to sew my own churidars and salwar kameez’s I just managed with a couple of dresses because dad was very clear he wasn’t wasting money on clothes when he didn’t have a lot of money and I would outgrow them anyway !! Diwali then would start with Appa applying sesame oil lightly warmed with pepper in it, on my head, the original “champi” and then I would get a small ladoo called “Deepavali marunthu” – this was a medicine almost, made with various nuts, herbs ground into a powder and then cooked with ginger juice and lots of ghee. This semi- solid stuff ensured that you digested all the sweets and other food that you ate during the day. By the way all this would start at 4.30 am and I had no choice of sleeping in late !! Then the “chakri” would be lit and Diwali started. Food will be special and we would all wear new clothes. In the evening Appa would patiently hang up the 100-wala cracker and light one end of it using an agarbatti. Amma would spend the week before Diwali putting the crackers from last year out in the sun so that they would crackle and go off with a bang. Appa still has a bunch of crackers from 2007 lying somewhere in the attic in the Hyderabad home – we need to find it someday. We would also shine all the brass “diyas” (lamps) and put oil and light them up all over the house. One year Appa created a string of zero watt tiny bulbs and he would hang that up in addition to the lamps.. It’s still there and works as well. 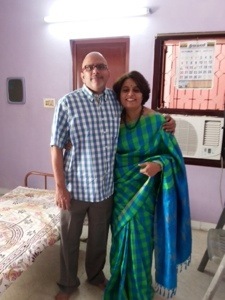 Then I got married and the same ritual continued with even more rigor at my mom-in-law’s place with “madi” – I could not cook till I wore clothes that had been dried untouched and I touched them only after taking bath and washing my hair. The variety of food obviously was even better as my mom-in-law’s repertoire is just mind blowing. The added ritual of putting “nalungu” – “aalta” for my North Indian friends, a quick paste made with turmeric and kumkum, that is red in color for my friends who are not from any part of India, on Krishnan and my feet by my mom-in-law and then the oil on our heads. New clothes would be given to us as we fell at our parents’ feet. I have a feeling the whole idea of doing the “namaskar” at the temple and for elders was to ensure people got good exercise :):):). The sweet box thing is not so prevalent in the south of India.. And when we moved to Delhi in 1997 we were introduced to the whole Diwali gift ritual. We adopted it too for some years, and some years we would not do much. But new rituals got added – buying a whole lot of nuts, like cashew, pista and almonds, visiting people, buying fancy earthenware diyas and all the electric lamps that would light up people’s houses. While we wore new clothes for Diwali, they had been bought long back when the shopping binge had happened .. And slowly the time that we woke up also changed. I still remember wearing a sweater in Oct 1997 on the Diwali day and then as the years went by winters came later and later. Diwali today is with Krishnan’s mom and brother, sister-in-law and Dhanush in Chennai. 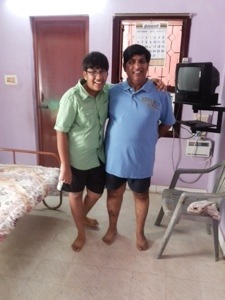 We drove down from Bangalore and all of us wore new clothes, just none of the other rituals were done …. The modern ways took over, I guess. 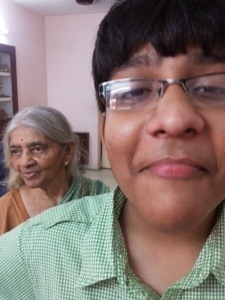 We still did “namaskar” by prostrating at my mom-in-law’s feet, then at God’s altar, I didn’t help in the cooking as I was not “madi” but ate everything that had been cooked with gusto ! Awesome food as always. There are some crackers going off here and there, but I guess the dark night has to descend before the skies are lit up. Modern Diwali …. SMS’s fly around, emails to all, Facebook status update, google plus updates, pictures of new clothes shared instantly, every shop has a Diwali discount, sweet shops like Haldirams don’t even have the time to count the money and you can drop a pin in the crowd on Ranganathan street T. Nagar, Chennai and hope it will hit the ground :):) oh I forgot, TV channels with Diwali special programs, movies releases, card parties in Delhi, and Chinese lamps lighting up houses. Schools even have campaigns against bursting crackers and social media carries messages about making Diwali meaningful by help the underprivileged. All good …. But there is some nostalgia for the old way of celebrating. No sweet shops that kill people with sugar overdose and diabetes, quiet days and nights to prep for one day of crackers, not the everyday cacophony, no shopping binges, but new clothes once a year, no TV shows, but families getting together to chit chat. Maybe the principle of scarcity is prompting this – scarcity for what was :):):) Well, another modern tool of blogging being used to capture nostalgia ! Happy Diwali everyone – make it special in your own way with your special people !! Very nicely put …. How I miss Diwali this year!!! Happy Diwali to you and Krishnan….this post took me to my childhood days…how we middle class families celebrated…best memories of our lives ! !